«Stelios Orphanoudakis» Distinguished Lectures are organised every year by one of the Institutes of the Foundation for Research and Technology - Hellas (FORTH), in Crete, to honor the memory of Stelios Orphanoudakis (1948-2005), Professor at the Computer Science Department of the University of Crete, Director of the Institute of Computer Science of FORTH (1994-2004), and Chairman of FORTH from 2004 until his premature loss, on the 18th March 2005. He was a visionary pioneer in the field of Information Society Technologies. He made fundamental academic and scientific contributions at an international level in research areas such as image processing and analysis, medical and diagnostic imaging, medical informatics, computational vision and robotics. He was instrumental in enhancing the role of FORTH on the international scientific scene, promoting and supporting scientific research in Greece and in Europe, as well as in promoting the exploitation of results through the foundation of spin-off companies. 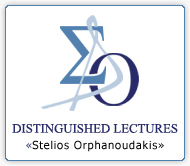 Keynote speakers of the «Stelios Orphanoudakis» Distinguished Lecture series are internationally recognised personalities nominated by a Selection Committee comprising eminent scientists from within and outside FORTH.